The Universal Anesthesia Machine’s manual bellows ensure safe assisted respiration even without a high-pressure gas source. Frustrated with anesthesia machines that conked out when the power faltered, Dr. Paul Fenton came up with a solution: The Universal Anesthesia Machine. Fenton’s Universal Anesthesia Machine took home the top health prize at the Tech Awards Gala. The awards salute innovations that address urgent humanitarian problems. Read the full story on NPR. 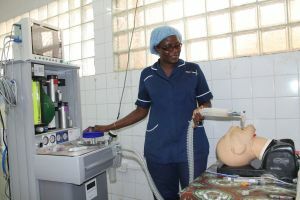 Johns Hopkins Department of Anesthesiology and Critical Care Medicine (ACCM) is helping to introduce Gradian’s Universal Anesthesia Machine in Sierra Leone. For their training they used IngMar Medical’s RespiTrainer® —a multi-skill ventilation and airway trainer—and its QuickLung® Breather—a test lung capable of active breathing. Read the full story.